It was just great to meet up, talk about the recent Supernovas (particularity the recent one in M82), and share what scopes we use and what we’ve observed over the past club year. And it was tasty time socializing over delicious pot luck food. Thanks for all those great dishes, folks! 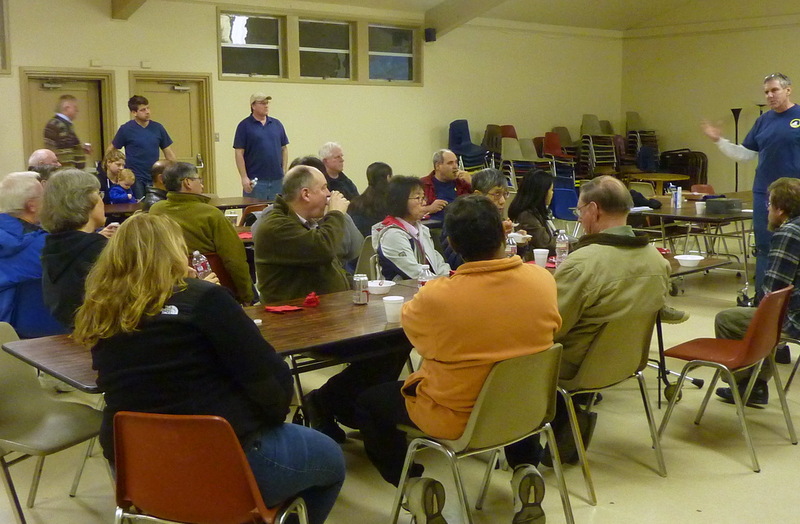 But of course this was SJAA’s annual Membership Meeting. We elected board members, and for the first time, presented awards to volunteers who helped make our Star Parties, Classes and Events a success. SJAA had four board seats up for vote. Members reelected Dave Ittner, Greg Claytor, and Rob Jaworski for three of the seats. We still have an open board seat, so if you or someone you know is interested in serving, let our board members know (board email: sjaa.mail@gmail.com). For his key participation in SJAA’s Fixit Program. Phil has constantly shown up at the Fixit sessions with his tool box in hand and ready to help. Phil brings with him years of knowledge with telescopes and the hobby and is always willing to share that knowledge. For her general volunteer help and help to make the new Solar Program at Houge Park a success. Terry is a veteran member of SJAA but moreover has been an “active” member attending SJAA programs and Star Parties for years. She also helps out at our school star parties. For his generosity and technical support of the Solar Program. Carl is a veteran member of SJAA and an active member with SJAA and the astronomical community. Carl has contributed solar images to the newsletter and solar blog and has shared his Calcium K-line filter at solar parties for public viewing. For their across-the-board astronomy outreach. This past year Bill and Susan O’Neil have set up scopes at SJAA’s local star parties and outreach programs we hold at Open Space Reserves and City Festivals throughout the South Bay and beyond. And last year they became volunteer rangers sharing astronomy at our National Parks. For performing all the heavy lifting to move to the new SJAA website. Frank personally took it upon himself to not only help move the website content, but as a side effect, he also helped test the new site, and spent considerable time and effort formatting the data. For his enthusiastic public star party participation and outreach efforts. Richard is a regular contributor at our Star Parties at Houge Park as well as Rancho and other sites. These public outreach events can’t be done without volunteers, and Richard is “the constant”. For his years of being a very regular part of the regular School Star Party program. The School Star Party program is probably the most low-key of all SJAA programs, but one of the most appreciated by its ‘customers’, local schools and educational institutions. Paul is one of the few individuals who can be counted on to be there, sharing a variety of telescopes with students, their families, and their school communities. 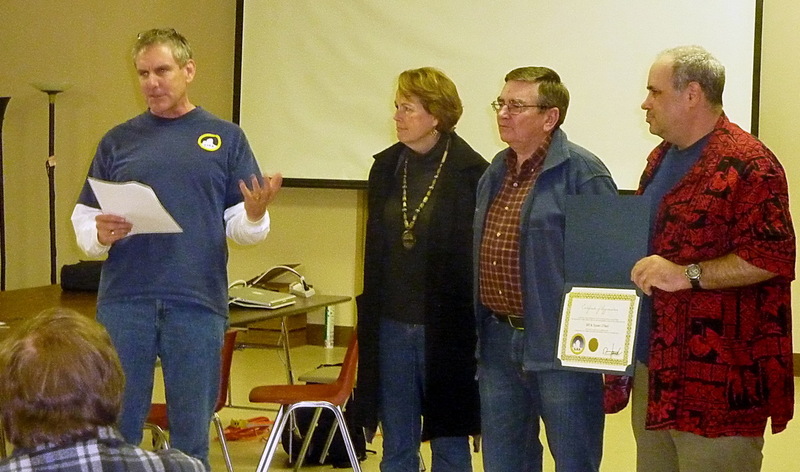 Bill and Susan O’Neil, above, are recognized for their outreach. 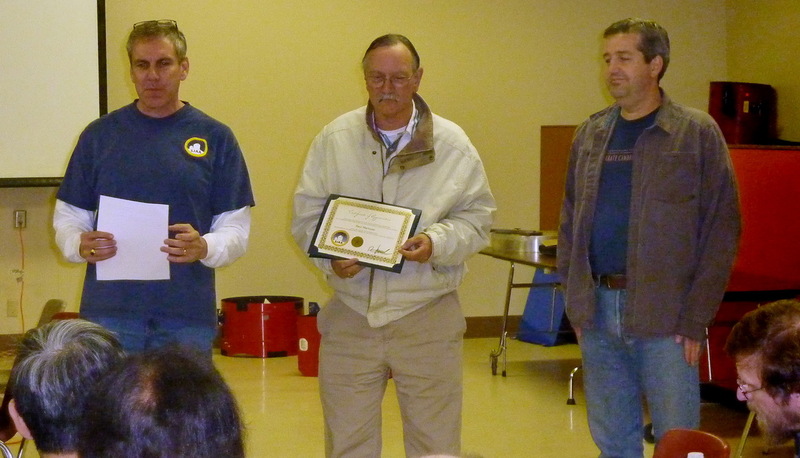 Paul Mancuso, above, is presented with a volunteer award. 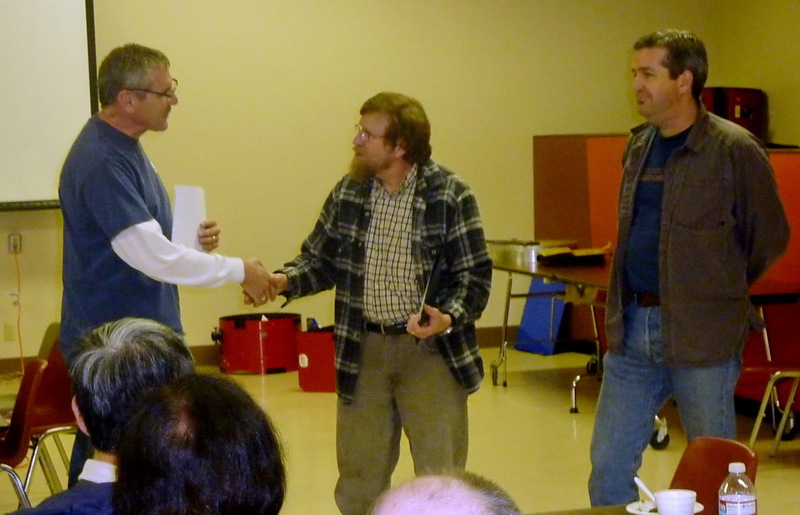 Richard Stone, above, receives a recognition award. Thanks again to all for a great Annual Meeting. See you in the field and upcoming meetings! SJAA member image: Supernova In M82! The Supernova in M82 (a galaxy that is over 11 million light years away) is now visual magnitude 11 – still bright enough for a moderate sized scopes (6-8 inches) under moderate skies. I’m up at 3:00 after a super pot luck at SJAA Houge Park! 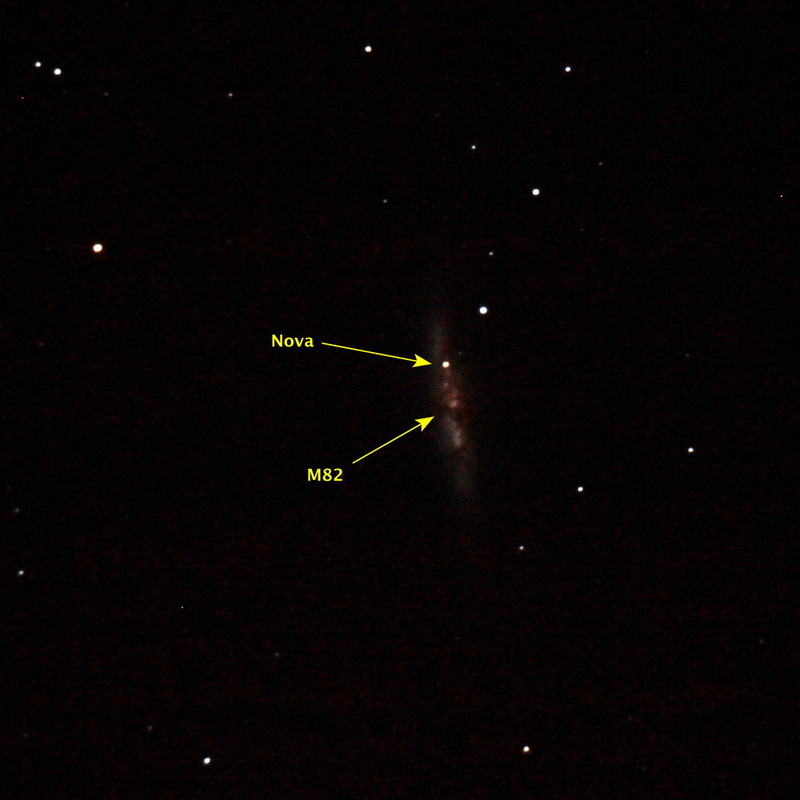 We had a chance to show our picture of the recent super nova in M82. We took the data on 01/25/2014 at RCDO from about 10:30-10:50. Our setup was a Orion Sirius EQ mount, Celestron C8 and Canon T3i SLR back and no auto guiding. We’ve been evolving our technique which now includes operating the camera from our Mac iBook Air using a USB cable and the free Canon camera software utility. Controlling the camera from a laptop was a big step forward for us. Finding the right camera scope connection was the hardest bit. There is a lot of things we tried that didn’t work. We settled on a T-ring/Cannon adapter ring connected to the SLR back with a short celestron 1-1/4 inch t-ring adapter found with the help of an SJAA star party neighbor who loaned us one to try. We took about 15 shots mostly at ISO of 800 using 30 sec exposure time. A couple ISO 6400 shots were also taken. I used about 12 images (JPEGS) stacked with FIGI (ImageJ on my iMac) which is free. ImageJ has an interface that is kind of like talking to space aliens but worth the effort to figure out (might make a nice SJAA class). It also allows you to create the label art like seen in the photo.